For other uses, see Stade de France (disambiguation). Not to be confused with Stade Français. Stade de France (French pronunciation: ​[stad də fʁɑ̃s]) is the national stadium of France, located just north of Paris in the commune of Saint-Denis. Its seating capacity of 80,698 makes it the eighth-largest stadium in Europe. The stadium is used by the France national football team and French rugby union team for international competition. The Stadium is the largest in Europe for track and field events, seating 78,338 in that configuration. Despite that, the stadium's running track is mostly hidden under the football pitch. Originally built for the 1998 FIFA World Cup, the stadium's name was recommended by Michel Platini, head of the organising committee. On 12 July 1998, France defeated Brazil 3–0 in the 1998 FIFA World Cup Final contested at the stadium. It will host the opening and closing ceremonies and the athletics events at the 2024 Summer Olympics. It will also host matches for the 2023 Rugby World Cup. Stade de France, listed as a Category 4 stadium by UEFA, hosted matches at the 1998 FIFA World Cup, the UEFA Champions League finals in 2000 and 2006, and the 1999 and 2007 Rugby World Cup, making it the only stadium in the world to have hosted both a Football World Cup final and a rugby union World Cup final. It also hosted seven matches at UEFA Euro 2016, including the final, where France lost to Portugal 1-0 after extra-time. The facility also hosted the Race of Champions auto race in 2004, 2005, and 2006. 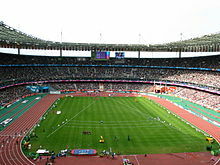 The stadium hosted the 2003 World Championships in Athletics and from 1999 to 2016 it hosted the annual Meeting Areva athletics meet. The European Athletics Championships will be held there in August 2020. The facility is owned and operated by the Consortium Stade de France. The discussion of a national stadium in France came about as a result of the country's selection to host the 1998 FIFA World Cup on 2 July 1992. As a result of the selection, the country and the France Football Federation made a commitment to construct an 80,000+ capacity all-seater stadium with every seat in the facility being covered. It was the first time in over 70 years since the construction of the Stade Olympique Yves-du-Manoir that a stadium in France was being constructed for a specific event. Due to the magnitude and importance of the facility, the Council of State was allowed first hand approach to how the stadium would be constructed and paid for. The Council sought for the stadium to be built as close as possible to the capital of France, Paris, and that the constructor and operator of the facility would receive significant financial contribution for a period of 30 months following the completion of the stadium. The stadium's design was handled by the team of architects composed of Michel Macary, Aymeric Zublena, Regembal Michel, and Claude Costantini who were associated with CR SCAU Architecture. The stadium was officially ready for construction following the government's selection of manufacturers, Bouygues, Dumez, and SGE, and the signing of building permits on 30 April 1995. With only 31 months to complete the stadium, construction commenced on 2 May 1995. The laying of the first cornerstone took place five months later on 6 September. After over a year of construction, over 800,000m ² of earthworks had been created and as much as 180,000 m³ of concrete had been poured. The installation of the roof, which cost €45 million, and the mobile platform also took more than a year to complete. During the developmental phase, the stadium was referred to in French as the Grand Stade ("large stadium" or "great stadium"). On 4 December 1995, the Ministry of Sport launched a design competition to decide on a name for the stadium. The stadium was officially named the Stade de France after the Ministry heard a proposal from French football legend Michel Platini, who recommended the name. The stadium was inaugurated on 28 January 1998 as it hosted a football match between France and Spain. The total cost of the stadium was approximately €290 million. The match was played in front of 78,368 spectators, which included President Jacques Chirac, with France winning the match 1–0 with Zinedine Zidane scoring the lone goal, and the first-ever in the Stade de France, in the 20th minute. Six months later, France returned to the stadium and defeated Brazil in the 1998 FIFA World Cup Final to earn their first World Cup title.Stade de France has hosted group, quarter-final, semi-final and the final match of 1998 FIFA World Cup. The national rugby team's first match in the facility was contested five days after its opening, on 2 February, with France earning a 24–17 win over England in front of 77,567 spectators. Philippe Bernat-Salles converted the first ever try at the stadium scoring it in the 11th minute of play. On 24 May 2000, the Stade de France hosted the 2000 UEFA Champions League Final. In the match, which saw 78,759 spectators attend, Spanish club Real Madrid defeated fellow Spaniards Valencia 3–0. In 2003, the Stade de France was the primary site of the 2003 World Championships in Athletics. Three years later in 2006, the facility hosted another UEFA Champions League final with another Spanish club Barcelona defeating England's Arsenal 2–1. On 9 May 2009, the Stade de France set the national attendance record for a sporting match played in France with 80,832 showing up to watch Guingamp upset Brittany rivals Rennes 2–1 in the 2009 Coupe de France Final. On 22 May 2010, the Stade de France hosted the 2010 Heineken Cup Final. On 11 February 2012, a Six Nations international rugby game between France and Ireland had to be cancelled just before kick-off due to the pitch freezing as the stadium lacks under-soil heating. On 13 November 2015, in one of a series of coordinated shootings and bombings across Paris, the Stade de France was targeted with explosions occurring outside the stadium during an international friendly between France and Germany, with French President François Hollande in attendance. The terrorist, however, was unable to enter the stadium. In 2016, the Stade de France was used as the central stadium for the 2016 Euros hosting seven matches. The stadium was used for the opening ceremony of the tournament which saw French DJ David Guetta perform at the stadium. At the end of his set, Guetta invited Swedish singer Zara Larsson on stage to perform the tournament's official song - "This One's for You". Following the ceremony the stadium was used for the tournament's opening game which saw France beat Romania 2-1. Across the next month, the stadium was used for six other tournament matches including the UEFA Euro 2016 Final between France and Portugal. The match followed the closing ceremony which again saw David Guetta perform. Portugal defeated France in extra time by one goal to nill and lifted the tournament trophy for the first time. The stadium was built without any undersoil heating as noted when Ireland were due to play France in the Six Nations Tournament rugby union match of 2012, in which the game had to be canceled. In 2002, the International Association for Bridge and Structural Engineering (IABC) awarded a prize recognizing the unique structure of the Stade de France commenting that the Stade de France exhibited "a construction of an attractive open architecture of the city, with an elegance and natural lightness". As part of its policy of renewing its infrastructure, the Stade de France added two new big screens in September 2006. The new displays have a surface 58% greater than the previous screens installed in 1998. The newer giant screens are each composed of 4 423 680 LED (Light Emitting Diode) for a self-made images more fluid, faster, and more particularly bright. The stadium was also used for music concerts with The Rolling Stones, Tina Turner, U2, Guns N' Roses, Muse, Rihanna, AC/DC, Justin Timberlake, Céline Dion, Bruno Mars, Beyoncé, Jay Z, Coldplay, Red Hot Chili Peppers, One Direction, Eminem, Lady Gaga, Paul McCartney, Roger Waters, Prince, Madonna, The Police and Depeche Mode having performed here. 1998 25 July The Rolling Stones Jean-Louis Aubert Bridges to Babylon Tour 76,716 First concert at the stadium. 5 September Johnny Hallyday 215,215 The concert was recorded for the singer's live album Stade de France 98 Johnny allume le feu. 1999 19 June Céline Dion Dany Brillant Let's Talk About Love World Tour 162,903 The concerts were filmed for the singer's concert film Au cœur du stade and recorded for the live album with the same name. 29 May Johnny Hallyday Tour 66 The concerts were recorded for the singer's live album Tour 66 : Stade de France 2009. 27 June Depeche Mode M83 Tour of the Universe 65,005 The concert was recorded for the group's live albums project Recording the Universe. 11 July U2 Kaiser Chiefs U2 360° Tour 186,544 The performance of I'll Go Crazy If I Don't Go Crazy Tonight from the concert was recorded for the group's live album From the Ground Up: Edge's Picks from U2360°. 12 July The performance of Angel of Harlem from the concert was recorded for the group's live album From The Ground Up: Edge's Picks from U2360°. 11 September Mylène Farmer Mylène Farmer en tournée 163,457 The concerts were filmed and recorded for the singer's concert film and live album N°5 on Tour. 26 June Indochine Meteor Tour The concert was filmed and recorded for the group's concert film and live album Putain de stade. 18 September U2 Interpol U2 360° Tour 96,540 The performance of Moment of Surrender from the concert was recorded for the group's live EP Wide Awake in Europe. 30 June Red Hot Chili Peppers The Vaccines I'm With You World Tour The concert was recorded for the group's live albums project Red Hot Chili Peppers Official Bootlegs. 2 September Coldplay Marina and the Diamonds, Charli XCX Mylo Xyloto Tour 77,813 Part of the concert was filmed and recorded for the group's concert film and live album Coldplay Live 2012. Rihanna appeared onstage for two songs. 2013 8 June Rihanna David Guetta, WE ARE GTA Diamonds World Tour 78,841 At that time, Rihanna became the youngest act ever to headline the stadium. 27 June Indochine Black City Tour Two concerts were filmed and recorded for the group's concert film and live album Black City Concerts. 12 September Beyoncé and Jay Z On the Run Tour 147,012 The concerts were aired by HBO. Nicki Minaj appeared on stage for one song. 15 July The 2018 FIFA World Cup Final was broadcast live before the start of the concert. The Stade de France has no regular tenant other than the French national football and rugby teams. Repeated attempts to persuade a professional football or rugby team to move there have failed so far. Upon the construction of the stadium, Paris Saint-Germain declined to move there, choosing to remain at the Parc des Princes under pressure from its then-owner (pay-TV network Canal Plus) and the Paris city government. However, the Paris rugby club Stade Français have now established themselves as a semi-regular tenant. They began by scheduling their Top 14 home fixture on 15 October 2005 against Toulouse at Stade de France. Stade Français's president, Max Guazzini, publicly said that the club would have to sell 25,000 to 30,000 tickets to break even. Three weeks before the match, 61,000 tickets had been sold, setting a French record for tickets sold to a league match for any sport, including football. The final attendance was 79,454, smashing the national attendance record for a league match in any sport by more than 20,000. Five minutes before the end of the Toulouse match, Guazzini announced to the crowd that Stade Français's scheduled home fixture against Biarritz in March 2006 would also be held at Stade de France. The Stade-Biarritz match broke the attendance record from earlier in the season, with 79,604 present. Guazzini then booked the Stade de France for the same two league fixtures in 2006–07. The Biarritz match on 16 October 2006 drew 79,619, making this the third consecutive Stade Français fixture at the Stade de France to set an all-time French attendance record. The record was broken yet again at a match against Toulouse on 27 January 2007, with 79,741 filling the stands. Stade Français went on to schedule three home matches at Stade de France in the 2007–08 season. For the 2008–09 season, they booked Stade de France for three home league matches and a Heineken Cup pool match. The number of Stade Français home matches at Stade de France increased again for 2009–10, with five Top 14 fixtures already announced for the stadium. Even with the lack of a regular league tenant, the stadium's revenue increased greatly in 2007, as it was used extensively during the 2007 Rugby World Cup in France, where it hosted numerous pool matches, a quarterfinal match, both of the semi finals and the final. The Lille OSC football team played all its "home" games in European competition during the 2005–06 season, both in the UEFA Champions League and the UEFA Cup, at the Stade de France because its own stadium was then under renovation, and the only nearer alternative on French soil, Stade Félix-Bollaert, was not available as that ground's occupant, Lille's local rival Lens, was also participating in the UEFA Cup. 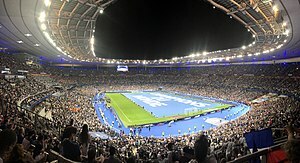 The Stade de France has hosted the Champions League final on two occasions: 2000 (Real Madrid 3 Valencia 0), and 2006 (Barcelona 2 Arsenal 1). France's governing body for rugby union, the French Rugby Federation (FFR), announced in November 2010 that it would not renew its deal to use Stade de France for international rugby matches when it expires in 2013. FFR also stated that it planned to build a new stadium of its own in the Paris region. Reportedly, the FFR had become increasingly frustrated with several aspects of the deal. According to rugby journalist Ian Moriarty, "The deal with the Stade de France has been a disaster for the FFR financially over the years, forcing France's powerbrokers to look across the English channel at the RFU's Twickenham cash cow with ever increasing envy." Reports vary widely as to how much the FFR must spend to rent out the stadium, but estimates range from €3 million to €5 million per match. Although the Stade de France and Twickenham are roughly the same size, the rental expense means that the FFR reportedly makes about one-third as much from a Stade de France sellout as does the RFU from a sellout at Twickenham. In addition, the national rugby team does not enjoy primacy at the Stade de France; the national football team and major concerts take priority. FFR had to move two of its 2010–11 home Tests to Montpellier and Nantes due to fixture clashes with the national football team. Also, former FFR president Serge Blanco claimed that the 2009 Top 14 final had to be moved from May to June because of a conflict with a Johnny Hallyday rock concert. In June 2012, FFR announced that it had selected the site for its new ground, tentatively known as Grand Stade FFR. The 82,000-seat stadium, featuring a retractable roof and slide-out pitch, was to be built on a former horse racing track in Évry, about 25 km (16 mi) south of Paris. The new stadium, estimated to cost €600 million, was originally scheduled to open in 2017, but completion was later pushed back to the 2021/2022 time frame. FFR officially abandoned the stadium project in December 2016. Although located at the crossroads of auto-routes A1 and A86, it is not advisable to go there by car unless you have reserved parking. The Stadium was built with a very limited number of parking spaces, which is why public transportation is considered the primary means of getting to the stadium. River shuttles are provided by the Canal Saint-Denis. ^ "History". vinci.com. Archived from the original on 1 October 2011. ^ "Equipes de France – FFF". Fédération Française de Football. ^ Amit. "Euro 2016 – How is Stade de France stadium?". Euro 2016. Archived from the original on 25 September 2015. ^ Edwards, Luke (February 2008). "6 Nation stadiums records". EMP-Sport. Archived from the original on 8 October 2011. Retrieved 18 September 2009. ^ "Toulouse outmuscle Biarritz to win uninspiring Heineken Cup final". The Guardian. 23 May 2010. ^ "Six Nations: France v Ireland match called off at last minute". BBC Sport. ^ Metro.co.uk, Tanveer Mann for. "BREAKING: Two explosions heard in Stade de France during France v Germany game". Metro. Retrieved 13 November 2015. ^ Tourisme, Seine-Saint-Denis. "Euro 2016 at Stade de France: Fixtures, Tickets and information". Uk.tourisme93.com. Retrieved 18 November 2018. ^ "Uefa Euro 2016: Opening ceremony at the Stade de France as it happened". International Business Times. 10 June 2016. ^ "David Guetta and 150 can-can dancers, welcome to the Euro 2016 opening ceremony". Independent.co.uk. Retrieved 18 November 2018. ^ "France 2-1 Romania". Bbc.co.uk. 10 June 2016. Retrieved 18 November 2018. ^ "Follow the Euro 2016 closing ceremony live". Standard.co.uk. Retrieved 18 November 2018. ^ Smyth, Rob (10 July 2016). "Portugal 1-0 France: Euro 2016 final – as it happened". Theguardian.com. Retrieved 18 November 2018. ^ "Stade de France – Key figures". Archived from the original on 24 November 2006. ^ Lichfield, John (3 February 1998). "French humiliated by frozen pitch". The Independent. London. ^ a b "French national rugby team plan to quit Stade de France". BBC Sport. 25 November 2010. Retrieved 6 July 2012. ^ a b c d Moriarty, Ian (5 July 2012). "Money talks". ESPN Scrum. Retrieved 6 July 2012. ^ a b "France announce plans for new stadium". ESPN Scrum. 29 June 2012. Retrieved 6 July 2013. ^ "Projet Stade" (in French). French Rugby Federation. Archived from the original on 15 June 2012. Retrieved 6 July 2012. ^ "Le Stade: Les dates clés" (in French). French Rugby Federation. Archived from the original on 24 October 2016. Retrieved 5 September 2016. ^ Bates, Charlotte (14 December 2016). "The French rugby federation abandon plans for new stadium". Sky Sports. Retrieved 12 February 2017.